Cape Palmerston - A hidden treasure to be sure! Palmerston Reserve is a beautiful, remote pebbly beach facing the mighty Pacific Ocean as it constantly pounds the rocky outcrops. Set back from the beach itself the area is fringed by lush rainforest, which thrives along the rugged coastline. These coastal waters of the Pacific Ocean possess extraordinarily abundant and diverse marine life, which becomes accessible as the tide ebbs. The cracks, ledges, and depressions become tidal pools abundant with marine life such as starfish, sea snails, crabs, sea urchins, mussels, sea anemones, and much more. While the sea animals are bathing in the tidal pools, the outer perimeters of these rock formations are still being pummeled by the ocean swell. The ocean crashes into the rocks creating stunning displays of ocean spray at some great heights, providing a dramatic back-drop for the calm tidal pools. A walk across the narrow stream and along the beach (or at high tide take the forest trail) leads to another bay. Eventually a cabin will come into sight, which has been built by a local resident, and can be used in emergencies. It is fully equipped with some basic food, a wood burner, foam padding for the bunks, and even a shower and toilet. Make an entry into the visitor book but be sure to leave the cabin as you found it. If your car or truck can endure a rough 2 hour drive on a logging road then the reward is well worth the effort. A spare tyre (or two) is recommended for this journey! 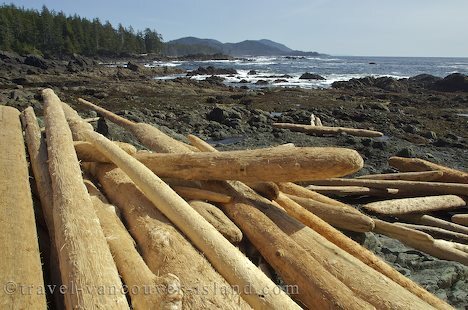 Photo of Cape Palmerston and drift wood along the beach near Cape Scott on Northern Vancouver Island, BC, Canada.